The Honor View 20 kicks off 2019 with a strong start. It's powerful, competitively priced, and the hole-punch display is a good preview for what we can expect from smartphones in 2019. It gets us one step closer to the dream of an all-screen smartphone and one step further away from the notch. The Honor View 20 is one of the first major flagships of 2019 and it’s looking to set the tone for what we’re going to see from Honor, its parent company Huawei, and other manufacturers for the rest of the year. Instead of a notch, the phone has a hole in its display, bringing us one step closer to the reality of having a full-screen smartphone. How much does the hole-punch display change the smartphone experience, and is it for better or worse? This is our full Honor View 20 review. Smartphones have looked more or less the same for a while. Whether they are high end, mid range, or even entry level, many phones utilize a similar combination of metal and glass. However, some phone makers are more creative. We saw a number of manufacturers last year, including Xiaomi, Huawei, OnePlus, and Honor, employ unique form factors, color gradients, or patterns to make their products stand out. Despite its simplicity, it's something we've never seen before and looks different from any other smartphone out there. The Honor View 20 comes in some very eye-catching colors, such as the blue model we received for review, and it also has a very striking “V” pattern etched into the back glass. Despite its simplicity, it’s something we’ve never seen before and it looks different from any other smartphone out there. It’s a beautiful pattern and it really shines when light reflects off the rear panel. The rest of the Honor View 20’s design is par for the course. It’s got glass panels on the front and back, with a metal frame wrapping around the edges. The View 20 is fairly manageable in one hand and is comfortable to hold as it makes good use of rounded corners and tapered edges. The curves also give the View 20 a modern appearance that fits in with many smartphones on the market. it's great to see Honor keeping the headphone jack in 2019. Going around the device, a single USB-C port can be found on the bottom, accompanied by a single speaker and a microphone. The right side of the phone has the usual power and volume buttons, the left side houses the sim card slot, and the fingerprint sensor sits on the back. On the top of the Honor View 20 is a headphone jack. This feature has been vanishing from flagships, so it’s great to see Honor keeping it. Another feature you might be surprised to see on the View 20 is the IR blaster. IR blasters on smartphones were a rather short-lived trend a few years ago, but Honor may be attempting to bring them back. Honor also included one in the recent Magic 2. The IR blaster lets you use the Honor View 20 as a remote for controlling your TV, cable box, and other peripherals in your home. The cutout, or hole punch, in the View 20’s screen is probably one of its most talked about features. It houses the front-facing camera and sits in the upper left corner of the display. According to Honor, it pushed the cutout as far into the corner as it could, though it appears it could go even further. The cutout replaces the notch that graced the front of many smartphones in 2018. We’re expecting to see this hole punch design on more smartphones throughout 2019. Although this is the first smartphone I’ve used with a hole punch display, I can already say that I much prefer it over a notch of any size. The cutout is smaller and obscures less of the screen. Coming from using the Pixel 3 XL, which has one of the largest notches around, the View 20’s cutout was a refreshing experience. If you’re worried about about how the hole punch affects apps, games, or software in general, don’t be. It shifts elements like the carrier logo, signal bars, and Wi-Fi indicator further to the right, but otherwise most apps, games, and UI elements are unaffected. Every once in a while, an app or game won’t properly account for the hole, and you may lose a tiny bit of content, but I found this to be pretty rare. The same holds true when watching video. Since the hole is so small, I didn’t find it very distracting. Moreover, you can see far more content than if the View 20 had a notch. I don’t imagine very many people will have a problem with the hole punch, but using a dark wallpaper is a good way to mask it if need be. Alternatively, Honor included a software feature that “hides” the hole punch by making the top portion of the display black. The overall quality of the screen itself is fantastic. The Honor View 20 has a large, 6.4-inch 19.25:9 display with minimal bezels around the sides. The LCD screen is vibrant, colorful, and bright enough to comfortably view outdoors. With a 2,310 x 1,080 resolution, it isn’t the sharpest display on the market. Unless you’re pixel peeping, though, you won’t notice it’s a 1080p panel. Being a flagship device, the Honor View 20 boasts formidable specs. The View 20 comes with 6GB or 8GB of RAM and 128GB or 256GB of internal storage. The processor is Huawei’s best and most powerful, the Kirin 980 chipset. This is the same processor used in Huawei’s own, high-end devices, such as the Mate 20 Pro. The Honor View 20 performs very well, both in benchmarks and in real-world use. It launches apps quickly, and multitasking and general navigation throughout the interface is smooth and fluid. The Kirin 980 is a best-in-class chipset. It handles both average day-to-day and power-intensive tasks like gaming without issue. Screen-on time easily hit the 7-hour mark which is well above average and should be more than enough for even the biggest power users. The Honor View 20’s battery life performance is equally impressive. A large, 4,000mAh battery powers the View 20, and the phone lasts an incredibly long time on a single charge. I typically ended the day with roughly 50 percent left in the tank, which is a comfortable reserve if you forget to charge the phone overnight. Screen-on time easily hit the seven-hour mark, which is well above average and should be more than enough for even the biggest power users. There’s no wireless charging onboard, which is unfortunate, but the View 20 supports 4.5V/5A FastCharge. This can get the Honor View 20 charged to 55 percent in 30 minutes. It isn’t as fast as some competing fast charging technologies, or even Huawei’s own 40W SuperCharge technology, but it’s still reasonably quick. The core hardware features of the Honor View 20 focus on liquid cooling, more accurate GPS, and better Wi-Fi reception. Honor calls the liquid cooling system The Nine. We’re not quite sure what the name means, but the system uses hardware and software to maintain proper temperatures. A liquid cooling tube connects to the chipset, time of flight (TOF) sensor, camera, battery, and charging chip to draw away heat. A cooling algorithm aided by AI monitors and predicts overheating issues. Resources are automatically allocated to optimize the View 20’s OS in real time. This is done to maintain the best temperature for a smooth and comfortable experience, particularly when gaming. The Honor View 20 uses dual-frequency GPS to better triangulate your position, which should be particularly helpful in dense urban areas where GPS signal can be hard to come by. 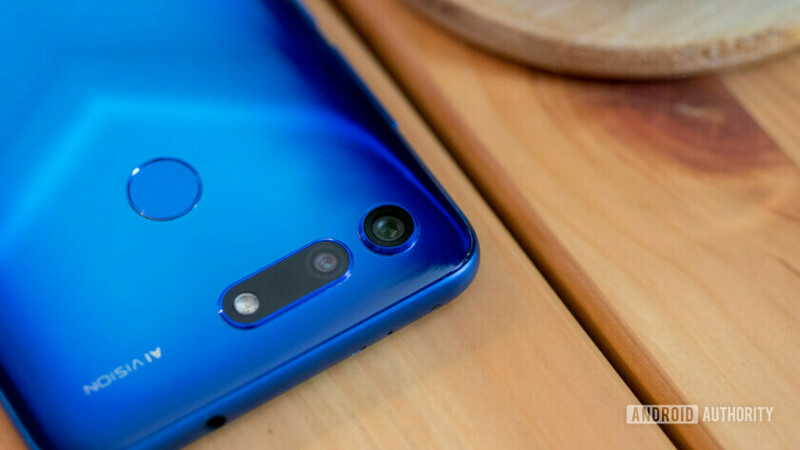 Instead of using just the L1 frequency, which has a very narrow bandwidth and a 300m error rate, the Honor View 20 uses L1 and L5 frequencies together. According to Honor, this offers 10 times more bandwidth and reduces the error rate to 30m. For improved Wi-Fi reception, Honor added a third antenna under the glass on the rear of the device. This improves Wi-Fi reception in landscape orientation, when your hands typically block the other antennas. The other two antennas are located on the sides near the front-facing camera on the left and the battery indicator on the right. This is another stab at improving the gaming experience. The most critical missing feature of the Honor View 20 is waterproofing. Honor told us the View 20 has a level of water-resistance suitable for casual use, but it didn’t provide too much detail. The phone can likely survive a sprinkling of rain, but keep it far away from the pool. The cameras are another standout piece of hardware on the Honor View 20. The front-facing camera is a 25-megapixel shooter with f/2.0 aperture and a 78-degree field of view. On the rear, the View 20 uses Sony’s latest 48-megapixel IMX586 sensor with f/1.8 aperture which is paired with a 3D TOF sensor. The 3D sensor improves depth detection for better portrait photos, and it can also help with 3D modeling, 3D printing, and augmented reality. The sensor is capable of scanning objects in 3D space up to one meter depending on the size of the object but 30-40cm is the optimal range. A new feature that utilizes the advanced depth detection of the 3D camera is called Shaping. You can find this feature when shooting in portrait mode or recording video. This allows you to make yourself look skinnier. Honor describes it as a feature meant to enhance your body shape so that you can get the perfect look at any time. In my testing it made my entire body look smaller including my head. It’s an interesting feature, to say the least, but I’m curious to see how users will react to it. Beauty mode is one thing, but introducing a feature that alters the shape of people’s bodies could stir up some controversy. Both front and rear cameras are capable of portrait lighting, background blur effects, and beauty mode for improving your selfie game. If you’re into taking selfies, the 25MP front camera is great for it. Images are sharp and rich in detail, and color reproduction is accurate with natural skin tones. The 25MP images allow for plenty of zooming and cropping without worrying about losing much detail. The rear camera produces even more impressive results, though we admit our expectations from this 48MP Sony sensor were very high. By default the camera is set to 12MP, so if you want the full 48MP resolution you’ll have to change it in the settings. However, when the camera is set to full resolution you sacrifice the ability to use digital zoom. Regardless of whether you’re shooting at 12- or 48MP, the camera produces great images in day-to-day use. The View 20 also supports 960fps slow motion shooting at 720p resolution. Images captured via the main camera are incredibly sharp, detailed, and, although I haven’t been able to take photos in sunny conditions due to the gloomy winter weather where I live, dynamic range seemed quite good. Color reproduction maintains a natural look and yet is vibrant enough to appeal to the eye. The camera handles white balance fairly well, regardless of shooting conditions. The View 20 uses the same AI-based scene recognition available in other Huawei and Honor devices and will automatically tweak the capture settings based on the subject and overall scenery. Low light photos with AI enabled creates for a brighter photo, better color accuracy, less noise, and improved dynamic range. How the camera processes the image varies from scene to scene. My biggest complaint with scene recognition is that it over sharpens. Images often look great when viewed as a whole, but look somewhat unnatural once you zoom in. Where I appreciate scene recognition the most is in low-light or nighttime photography. Enabling AI makes for brighter photos, better color accuracy, improved dynamic range, and less noise in low-light shots. In these side-by-side samples below you can see how much cleaner the AI images look and how drastically it improves highlights and color. We’ve embedded a gallery for easy viewing. For full resolution photos click here. The Honor View 20 runs Android 9.0 Pie with Magic UI 2.0. Magic UI is essentially a rebranded variant of Huawei’s EMUI with some tweaked aesthetics so Honor devices have their own look and feel going forward. As I’ve mentioned before, Magic UI is not my cup of tea. It is not very intrusive, and I like the flat look and colorful aesthetics, but it’s too much like iOS for my tastes. If you happen to like EMUI, you’ll have no problem with Magic UI on the View 20. I appreciate that Magic UI isn’t weighed down by an overabundance of features or pre-installed apps. Many of Magic UI’s features are practical and useful. There is a one-handed mode to make content on the screen easier to reach, and a handful of motion gestures to quickly launch apps or take screenshots. I also enjoy the party mode app, which lets you sync music playback across multiple phones to create a surround sound effect. It’s a great party trick, especially if you don’t have Bluetooth speakers or something more powerful to blast your music. The Honor View 20 first went on sale in China priced at 3,000 yuan (~$445) for the 6GB/128GB model and 3,500 yuan (~$520) for the 8GB/256GB version. It’s already available in a lot of European markets, where the 6GB variant goes for 500 pounds/570 euros. To get the beefed-up model with 8GB of RAM, you’ll have to dish out 580 pounds/650 euros. If we’re merely looking at pricepoint, phones such as the Moto Z3 and Sony Xperia XZ2 Compact, and the Nubia Red Magic Mars are a couple of the View 20’s biggest competitors. They’re great alternatives with comparable experiences. If you’re willing to spend a little more to gain features such as wireless charging and IP certification, phones like the Samsung Galaxy S9 and LG G7 are very good options. Since these two are a little older now you can usually find both at a discount. The Honor View 20 may not be the most anticipated flagship of 2019, but it’s a strong smartphone to kick things off. The phone is priced competitively and offers almost everything you could want in a high-end smartphone. It has great specifications with one of the most powerful chipsets on the market, dual-frequency GPS, triple antenna Wi-Fi, long battery life, and an excellent 48MP rear camera. It’s also the first smartphone to hit the market with a hole-punch display. The Honor View 20 is beautifully executed and hopefully will put an end to smartphone notches. If you want to get in on the hole-punch trend early, it’s an excellent starting point that’s both powerful and affordable. And that’s it for our Honor View 20 review. Are you interested in this phone?